Today it is officially spring according to my calendar. In the Northern Hemisphere, spring begins with the vernal equinox at 7:02 a.m. (EDT) on March 20, which is today. In Istanbul, it's already been looking like spring for the past few weeks as evidenced in several photos I've shared with you here. On Monday, I met a friend in Ortaköy and was greeted with an abundance of tulips already in bloom! I was surprised to see all these tulips in the middle of March. 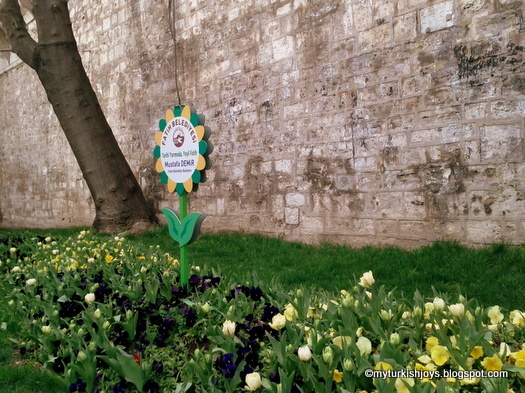 That means the millions of tulips that are planted every year at the Emirgan Korusu (Park) will soon be blooming too. Be sure to arrive at the park early and bring a picnic with you. The beautiful tulips are worth seeing, but the traffic along the shore road is always horrendous. Hopefully, the first day of spring wherever you are brings you flowers and sunshine. Unfortunately, it's been snowing off and on these past few days back at my parents in the U.S.
Last week, these tulips and pansies were blooming in Sultanahmet. I am so glad I found your blog. 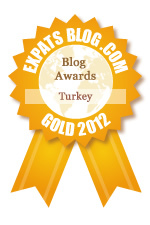 We will be in Istanbul the last week of May. It is wonderful to get insights and info. from your writing and photography. I noticed the tulips too and thought about Emirgan Park! Last year I was really amazed at the beautiful display they had there! Well worth the trip over there! happy spring! it is still very cold here! @thyme Sarah, you're welcome! Happy to hear you are finding my blog helpful. If you have any specific questions, just let me know. May is a super beautiful time in Istanbul! Enjoy! @Claudia, Great! I know I'm hoping I can pop by Emirgan next week to see how they are looking. Beautiful... I love tulips, always reminds me of Istanbul. I was in Yıldız Parkı last week and they were just getting ready to bloom, but the hyacinths and the grape hyacinths were out and they were lovely. @Ilke, I know, so do I! Glad we get to see everything in bloom here. @Sara Louise, Would love to see your photos of the French countryside in spring bloom! @Lale, Thanks for the update! I almost stopped at Yıldız Parkı as I was coming back on the bus from Ortakoy. Maybe I'll swing by there next week! can i see tulips and hyacinths in Emirgan park during first week of may ? i am visiting istanbul next month. @Richa, unfortunately you will not. April is really the peak time. You may find some other flowers around the city but not bulb-based ones.